This area at the base of Mount Sharp on Mars includes a pale outcrop, called “Pahrump Hills,” that NASA’s Curiosity Mars rover investigated from September 2014 to March 2015, and the “Artist’s Drive” route toward higher layers of the mountain. March 12, 2015 – NASA’s Curiosity Mars rover used its robotic arm Wednesday, March 11, to sieve and deliver a rock-powder sample to an onboard instrument. The sample was collected last month before the team temporarily suspended rover arm movement pending analysis of a short circuit. The Chemistry and Mineralogy (CheMin) analytical instrument inside the rover received the sample powder. This sample comes from a rock target called “Telegraph Peak,” the third target drilled during about six months of investigating the “Pahrump Hills” outcrop on Mount Sharp. With this delivery completed, the rover team plans to drive Curiosity away from Pahrump Hills in coming days. “That precious Telegraph Peak sample had been sitting in the arm, so tantalizingly close, for two weeks. We are really excited to get it delivered for analysis,” said Curiosity Project Scientist Ashwin Vasavada of NASA’s Jet Propulsion Laboratory, Pasadena, California. The rover experienced a short circuit on February 27 while using percussion action in its drill to shake sample powder from the drill into a sample-processing device on the arm. Subsequent testing at JPL and on Curiosity has identified the likely cause as a transient short in the motor for the drill’s percussion action. During several tests on the rover in the past 10 days, the short was reproduced only one time — on March 5. It lasted less than one one-hundredth of a second and did not stop the motor. 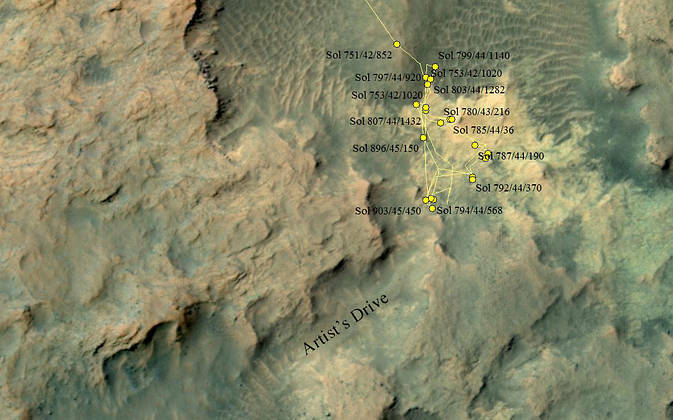 Ongoing analysis will help the rover team develop guidelines for best use of the drill at future rock targets. The rover’s path toward higher layers of Mount Sharp will take it first through a valley called “Artist’s Drive,” heading southwestward from Pahrump Hills. The sample-processing device on the arm is carrying Telegraph Peak sample material at the start of the drive, for later delivery into the Sample Analysis at Mars (SAM) suite of instruments. The delivery will occur after SAM prepares for receiving the sample. Curiosity’s drill has used a combination of rotary and percussion action to collect samples from six rock targets since the rover landed inside Gale Crater in 2012. The first sampled rock, “John Klein,” in the Yellowknife Bay area near the landing site, provided evidence for meeting the mission’s primary science goal. Analysis of that sample showed that early Mars offered environmental conditions favorable for microbial life, including the key elemental ingredients for life and a chemical energy source such as used by some microbes on Earth. In the layers of lower Mount Sharp, the mission is pursuing evidence about how early Mars environments evolved from wetter to drier conditions. JPL, a division of the California Institute of Technology in Pasadena, manages the Mars Science Laboratory project for NASA’s Science Mission Directorate, Washington, and built the project’s Curiosity rover.